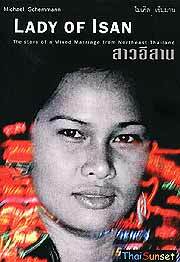 The Lady of Isan (ISBN 974-615-174-6, ThaiSunset publications) has the subtitle ‘The story of a Mixed Marriage from Northeast Thailand’. Written by Michael Schemmann, in his introduction he mentions the family of the 19 year old girl (the Lady of Isan) with whom he had just spent a night of passion. “Your penniless 42 year old mother and your father for whom you work the nights away in Pattaya in the arms of farangs like me. ‘Phom rak khun.’ You are so easy to love.” The last sentence says it all, prophetically. The book is a diary of the intense personal feelings of a middle aged farang, who falls for this 19 year old Isan girl. The author, and narrator in the story, had been living a life of abstinence for nine years, following the demise of his second marriage. He could be considered as ‘ripe for the picking’, but I do not feel his Lady of Isan actually ‘chose’ him. Rather he self-selected himself, and then only later could find it within himself to question and examine his own motives. For the first few years the author deludes himself that everything in his new marriage is fine. After all, he was doing well in his lecturing, and his young wife appeared to be well accepted in the hallowed halls of academia. They went on overseas trips together and spent weekends on tropical islands. His Lady of Isan was also studying to complete her high school education, bettering herself in his eyes. The book is distributed by Asia Books and has an RRP of B. 350, so it is not an expensive salutary lesson, and certainly very much cheaper than author Schemmann’s lesson in Thai life. It will not grace the lists of literary masterpieces of the decade, especially with so many ‘typos’ all the way through. (Note to the publisher: Duznt ennybodee prufe reed any moar?) I got the impression that this was a cathartic diary for the author, and although the back cover does say the story is based on fact and fiction, I believe the book would have been better served by sticking to the factual side - the story is strong enough to stand up on its own, without the GPS episode. It does effectively show some of the many differences between (North) East and West, and does also show a side of the ‘poor’ Isan families that does not sit well with the often quoted lack of choices experienced by the Thai girls from that area. Rose coloured glasses will be broken, and for that fact alone, this book is worth reading. Incredibly, by the time this album was released in 1981 by Vertigo Records as a live double album (oh those good old days of vinyl), Nazareth had already released thirteen studio albums. That does not include the masses of Greatest Hits, etc., that have been put out over the years by the record companies. That was surprising as Nazareth had always been known as a live band, guaranteed to deliver live and pack them in wherever they were booked. By not putting out their live albums until 1981, Vertigo rather missed the boat. Punk rock had already come and gone, which had not really hurt Nazareth as they were always too hard-edged to be roped in with the hated progressive bands like Pink Floyd, Genesis, etc. However, when you look at what live double albums did for the careers of the likes of U.F.O. with ‘Strangers In The Night’; Deep Purple with ‘Made In Japan’; or Thin Lizzy with ‘Live And Dangerous’, it raises the question of how would Nazareth have fared had they had the extra kick of a double live album out on the shelves as further grist to their mill. There is no doubt that this is a mighty tome indeed. Nazareth’s original Scottish quartet of musicians are still together by the time of Snaz. Manny Charlton with his thick chords and chopping riffs. Was there ever a tighter rhythm section of Pete Agnew and Darrell Sweet? And all topped off by the gravel vocals of Dan McCafferty, who sounded as though he gargled with acid before hitting the stage. The only changes to the lineup to this point had been the addition of fellow countryman Zal Cleminson (ex- The Sensational Alex Harvey Band) for a couple of albums and tours directly before this album. The story goes that the rest of Nazareth found Zal temporarily between bands driving taxis in Glasgow, Scotland. Not believing that such a talent was not actually playing in a rock ‘n’ roll band, they dragged him out of the taxi and immediately enrolled him in the band until he found his musical feet again. And then when he did, they let him go. After Zal departed, the band felt a bit of a musical void, so they enrolled fellow Scots Billy Rankin on guitar and John Locke on keyboards. Then they set out on a massive tour of North America, recorded every concert for their projected live album, and decided that the concert held at the Pacific Coliseum in Vancouver, Canada, was just what they wanted. So they discarded all the other recordings and put this one out in its entirety. I think they were right as it catches the band on what was definitely a special night. Starting with the epic ‘Telegram’ (the story of being on the road with a rock ‘n’ roll band, including the immortal lyric “I need your picture, smile this way, oh, by the way, will you tell me what you play?) they carried on till a rousing encore of Nazareth’s biggest hit, the ballad ‘Love Hurts’, followed by a version of ZZ Tops ‘Tush’, left both, band and crowd, breathless. In-between are all the classic Nazareth songs and cover versions which they became famous for. Of course this is one of the advantages of not recording your live album early in your career, but saving it till you have a full two hours of classic material. Mind you, if Nazareth had released a live album in the early seventies, they could have done an equally good one for the eighties. Snaz was first released on CD in 1997, but horrifically, that was a pretty poor effort as the sound was very tinny, and it was not possible to get all the material from the live double vinyl album onto one CD. As a solution they hacked off six tracks to make it a more manageable seventy minutes, and so completely ruined the flow of the running set, especially as it meant missing out ‘Big Boy’, magnificently penned by Zal Cleminson. However, Eagle Records have gotten hold of the original masters and under the expert supervision of Robert M. Corich and Mike Brown, the original Snaz has been returned to its full glory. The spread covers two CDs, has new liner notes, and even the two new studio tracks that had been tacked onto the end of the live recording in 1981 have been faithfully restored. Whether you want to buy a collection of Nazareth’s greatest hits or just of a very fine rock ‘n’ roll band doing what they do best on the live concert circuit, Snaz will not disappoint.